Coming from Australia, where there are no secretive doors and elusive members clubs, we love exploring this new tier of hospitality previously unknown to us. Tramp is one of London’s most exclusive and historic member’s clubs, opening its doors in 1969 and having seen everyone from classic icons like Frank Sinatra and The Beatles to modern day stars like Kate Moss and Rihanna. In 2019 Tramp will be celebrating its 50th anniversary, no easy feat in today’s fast-paced bar and restaurant scene. Always known for the legendary parties that carry from dusk to dawn, Tramp has already started to spread the word about the massive celebration they’re going to host next year. A select number of bloggers were invited to dine in Tramp’s decadent The Zodiac Room, and we couldn’t have been more excited. 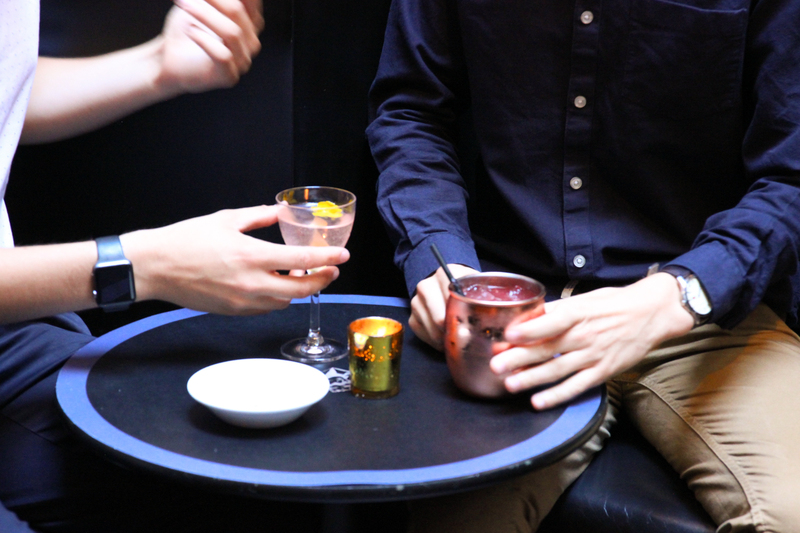 We began the evening with cocktails in a stunning open-roof courtyard area, where everyone unanimously agreed the favourite was ‘The Gold Digger’, a delicious drink served on ice in a copper mug and garnished with a fresh raspberry. After moving from the courtyard to The Zodiac Room, we were seated at a lavish round table in an room filled with crisp white table cloths, regal red painted walls and dim lighting. An elaborate Zodiac wheel was painted onto the ceiling, and smaller paintings of all the zodiac signs were strategically places around the room. 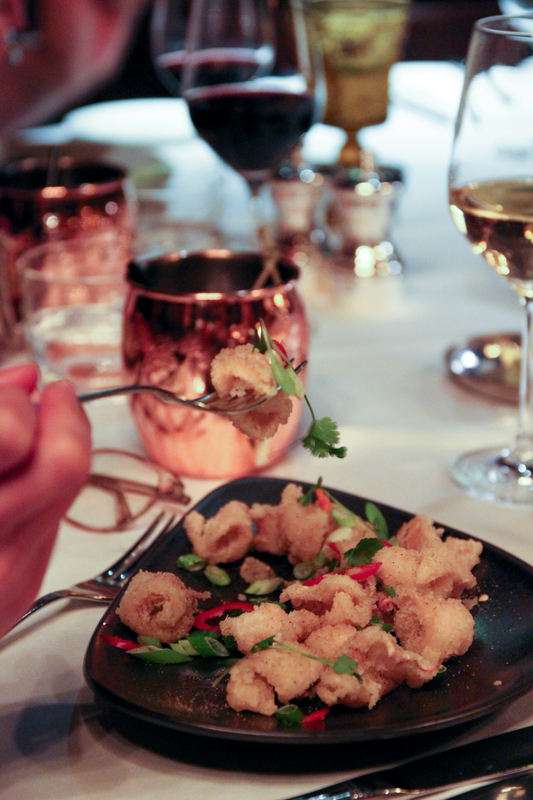 To begin with we nibbled on some of the best crispy calamari we’ve ever had. Sweet, salty and just a little spicy, this calamari was perfectly cooked and cleverly seasoned, creating an amazing dish to start the meal off, accompanied by a glass of white wine. For entrée we sampled the tomato ceviche and the smoked salmon. The ceviche was a gorgeously fresh bowl of different varieties of tomatoes, bocconcini and herbs, a light and refreshing option. The salmon was beautifully presented, flat on a plate and dressed with smoked avocado puree, keta caviar and pickled cucumber. Reminiscent of a carpaccio, this salmon dish was again light and fresh, but with a rich, salty flavour that was delicately balanced out by the avocado, caviar and cucumber. 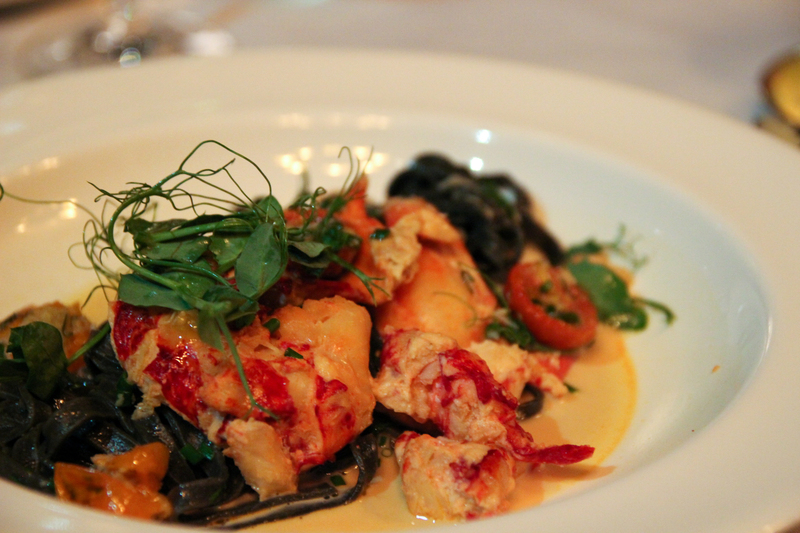 When one sees lobster and squid ink tagliolini on the menu, one always orders it. Some lobster pasta dishes often have tiny dregs of lobster throughout the sauce, but this dish was the total opposite. Generous chunks of freshly cooked lobster were piled on this plate, atop a bed of squid ink tagliolini in the lightest lemongrass-saffron bisque that let the flavours of the lobster shine through. We’d highly recommend ordering this dish, as the flavours were divine and the dish filling. For dessert, there’s something for everyone here. Whether you’re after a savoury cheese board washed down with a dessert wine, you have a sweet tooth that can only be sated by chocolate or you’d like to try something different like the pineapple carpaccio with coconut sorbet, they’ll be something on the menu to suit your taste. If you’ve never ventured into Tramp’s hallowed halls or you’re an Australian visiting for the summer, we’d suggest you try and get a table in one of their extravagantly decorated rooms and enjoy the food, drinks and history. We couldn’t be more excited for their 50th Birthday in 2019 and hope there are many more years to come.